Project 10 Pan is well under way - saving lots of money and getting through all my unloved makeup products!! 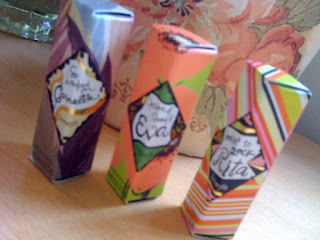 Anyways, I was browsing through Benefit yesterday (my friend wanted some new foundation and I convinced her to pick up a PlayStick, ooops) and I picked up FREE samples of their three new fragrances... Lookin' to Rock Rita, Garden of Good and Eva and So Hooked on Carmella. Benefit describe this fragrance as exhilarating and stylish, with top notes of coconut, lemon and freesia. This is my least favourite of the three scents, but it is still yummy!! This is my favourite of these new fragrances, with top notes of pear, watermelon, ozone accords and muguet. Benefit describe this fruity perfume as "fresh and crisp". This beautiful scent has top notes of lemon, grapefruit and rhubard. With a delicious bottom note of heavenly vanilla, this scent definitely is feminine and flirty. I will definitely be using all three perfumes and possible picking up their full-sized sisters when I finish Project 10 Pan!! Nic, they're not huge but they were free, so I'm definitely not complaining!! You should try get some at your Benefit counter.